You could be losing thousands of potential sales and conversions. The answer is simple. Your website is too slow. On the internet, every second counts. Every millisecond counts! If your site takes too long to load, people will leave and find somewhere else. Amazon would lose $1.6 BILLION every year if they slowed down by a second! Nearly half of internet users expect your site to load in less than two seconds. 40% will leave completely if it takes longer than three seconds to appear. It’s clear that speed matters. We love speed. We can’t get enough of it. We’re looking for answers quickly, and we expect to find them. A fast website means a better user experience. It means happy customers and more sign ups to your mailing list. It means more pageviews and more people sharing your content. It means more trust in you and your company. Bottom line: a fast website equals more sales. More profit. But it’s not just your visitors that are hungry for quick load times. Google actively seek out quick websites and rank them high on their search pages. They are looking for excellent user experience. And why wouldn’t they be? Google want to give their users answers. Fast. The quicker your website, the higher you rank on Google. You’re already wondering how your website measures up, aren’t you? I created Bitcatcha’s very own server speed checker for one simple reason. To show you how fast (or slow) your server is performing. Now, before I go into more detail, let’s break down the two main factors that affect your overall website load speed. Number 1: The server speed delivered by your webhost. Number 2: Your web design, cleanliness of code, cache, plugins and visual media. If this is confusing, think of it like a car. Number 1 (your server speed and web host) is your engine. It’s how long – in milliseconds – it takes for your server to respond to a request. This is what Bitcatcha’s server speed checker measures. Number 2 is everything else. It’s how long your images and content take to appear. In our car metaphor, it’s the bodywork, wheels and styling. Everything around the engine. Now, you can make your car’s bodywork more aerodynamic, and you can install the fastest, grippiest tyres. But if the engine is slow, you’re going nowhere fast. Sure, you can trim your code, optimise your images and compress your pages. But if your web host and server speed – your engine – is slow, then your whole website is slow. Web hosting holds the single biggest responsibility for the performance of your website. So – quite simply – Bitcatcha’s speed checker shows you how fast your engine – your web host – is performing. 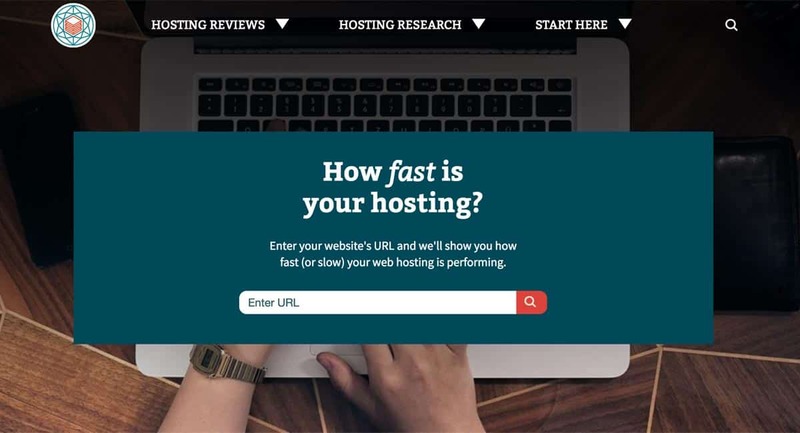 Is your web host holding you back? …is that there simply isn’t enough impartial information about what’s out there. Most new website owners tend to pick the cheapest option, with no thought to speed or performance. Even the larger webmasters tend to make judgements based on reviews, hearsay and personal recommendations. Where’s the empirical data? Where are the numbers? Shopping for web hosting is like shopping blind. You’re lost in a sea of opinions and anecdotal information. It’s too easy to get upsold a lousy service. Here at Bitcatcha, I want to offer people real numbers and facts! Of course, we do feature reviews and interviews too. But ours are backed up with cold, hard numbers. Server speed is one of the only measurable metrics of your web host. And that’s why I built the server speed checker. To show you how well your web host is working for you. With real, tested data. So, how does the Bitcatcha speed checker work? Well, for you, this part is super simple. All you have to do is enter your web address and press ‘go’. Now it’s our turn to do the computer wizardry and show you the numbers. Here’s how it works. After entering your domain name, we immediately resolve the DNS and find the real IP address. That tells us exactly where your server is. In plain terms, we locate the small corner of cyberspace your website is sitting on. Next, we send eight different pings to your server. That means we emulate the process of eight different people visiting your website. We do this from eight global locations. Namely, New York, LA, London, Brazil, India, Singapore, Japan and Australia. That way, we get a complete global picture of your server speed. We measure the time it takes for each of these ‘pings’ to get a response from your website. Now we’ve got eight median speed values. We calculate the average and present you with the results in milliseconds. Next, we benchmark the average results against Google’s recommendation – 200 ms – and assign a rating to it. So, what’s a good server speed result? Google have revealed that they’re looking for sites with a server response time of less than 200ms. Try your website on the Bitcatcha speed checker right now. If it’s slower than B+, it’s time for a change. It means your web host is holding you back. Your engine is too slow. It’s losing you conversions and driving your Google search rank down. Don’t worry, we’ve got plenty of resources to help you look for a faster, more reliable service. We’ve interviewed website owners and asked them about their web hosts. We’ve also built a tool to show you the best host for you. Are you a blogger, online seller, or consultant? We’ll show you the best host for your business. And, if you loved the Bitcatcha speed checker, please share it with your friends. Speed is important. Make sure your web host is keeping up. Thanks for reading. If you’ve got questions or stories about server speed, please get in touch. I’m here to help!